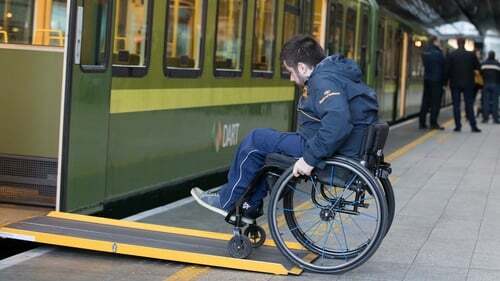 Iarnród Éireann has launched a pilot scheme on DART services to improve accessibility for wheelchair users. The programme will see the establishment of zones with 13 hub stations, which will be fully staffed at all times, each with a dedicated assistance phone line. Staff at each zone will respond to assistance requests for the hub station and between one and three other adjacent stations. This should reduce the advised notice period for those requiring assistance when travelling on the DART from 24 hours to four hours. Speaking on RTÉ’s Morning Ireland, Iarnród Éireann spokesperson Barry Kenny said it is hoped the scheme will make services better and more responsive to the needs of DART users. He said stations have been chosen based on their usage. The pilot scheme will run for six months. Mr Kenny said this scheme was about improving services but did not represent the end of improvements. However, Irish Wheelchair Association Director of Transport Michael Doyle said the accessibility scheme does not go far enough. Mr Doyle said it was not acceptable that anyone with a disability had to book ahead before travelling on a modern transport system. In addition, he said, the manning of the hubs was problematic because staff would man a number of hubs, meaning that someone could potentially be left waiting at one station, while another station was serviced.